Enter the Oasis of the Soul! Within you lies a well of inner resources. Dipping into that well brings sweet, refreshing water to the surface bringing new life to an otherwise parched environment. Your well is an oasis and drinking from it not only refreshes you it gives you energy, hope and strength. Do you dip into your well daily or do you wait until you are parched, thirsty, dehydrated and on the brink of exhaustion? Do you wait until the searing heat of the desert sun has beat you down before realizing the oasis you’ve been searching for is already there complete with a bucket waiting for you to dip in, fill it and bring the life changing waters to the surface? 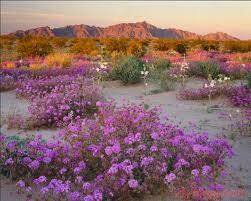 Although the desert seems barren & dusty it is full of life and can be beautiful and lush. If you’ve ever gone to the desert after it rained you will be witness to what I consider a miracle. Dormant flowers and plants rise out of the sand within days and what was once a dry, parched, brown landscape comes alive with all the colors of the rainbow. The bright sun is no longer harsh; It is nutrition for the new shoots as they finally show themselves after a deep slumber under ground. In turn, the flowers and plants give nutrition in many ways. They bring beauty to the eyes, fragrance to the air and feed a variety of desert creatures. Yes, a bit of rain on the desert creates a new landscape teaming with life! The sun can be scorching and water can drown you but they also have the power to heal and change your life. Isn’t it true that after days of rain, cloudy skies and gloomy winter we relish the light and heat from the sun? Isn’t it true that when the sun beats down in the heat of the summer we seek out the cooling waters of a pool or beach so we can then enjoy that same sun whose brightness and heat first caused you to put on your sunglasses and go inside? You have the light of that sun within you! You have the refreshing, cooling waters within you! Instead of walking in the desert dying of thirst and trying to get out of the sun you can use both to nourish your mind, body and spirit. Stop “walking” and “searching” and start “BEING”. Previous Post Destiny is yours to create! Are you trying to control it?